On Monday, November 6th, the AHS design team was honored for their entry during a ceremony in the Rotunda of the Kim Building. The University of Maryland Department of Aerospace Engineering was awarded second place in the 23rd annual AHS Student Design Award. Aerospace Engineering students designed a two-seat, single-engine turbine training helicopter with operating characteristics representative of the [world's] turbine [helicopter] fleet, while being cost-competitive with current [piston-engined] training helicopters, along with the conceptual design of a low-cost turbine engine. The American Helicopter Society (AHS) International is the world's premier professional vertical flight society. The AHS awards program acts as a catalyst for stimulating technological advances in the industry. The aim of the society is not only to emphasize and further engineering excellence in traditional rotorcraft platform disciplines, but also expand this focus to the multidisciplinary fields of vertical flight and related support industries. The competition promotes student interest in vertical flight technology. The first- and second-place winning teams are awarded a cash stipend and the winning team is invited to the AHS Annual Forum and Technology Display to present their winning entry. Members of the teams receive one-day complimentary registration to the forum, the vertical flight industry?s principal professional technical event. 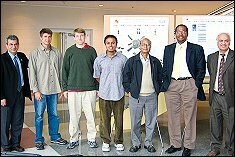 The 2006 team members include Peter Copp (team leader), Moble Benedict, Bryant Craig, Brandon Fitchett, Nitin Gupta, Arun Jose, Jishnu Keshavan, and Shyam Menon.